In its initial release audiences were leaving It Comes at Night muttering about how terrible it was. Bad word of mouth is killing the film's potential at the box office. Many great films fall victim to general consensus gelling around negative responses. It Comes at Night is not the first and it won't be the last. But it is a great film. Don't let people tell you otherwise. I think perhaps the negative reaction has to do with expectations, as it often does. When we convince ourselves we are going to see a certain film and the movie surprises us by being something completely different, we often react negatively. This is why people want trailers that ruin plots. The security of knowing what to expect is more important than the experience of having our expectations upended. We want to know what we're getting and have a hard time when things don't go as planned. Cause It Comes at Night is not what you expect it to be. It is also not an easy watch. It Comes at Night plays to some fairly base fears, the kind we don't often want to admit to, we don't often let see the light of day. 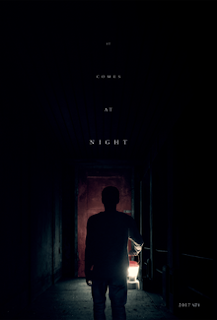 Marketed as a horror movie (cause Hollywood often doesn't have the vocabulary for a more diverse spectrum of films) It Comes at Night is about horrors, but not about monsters or "killers" or ghosts. It is about the horrors of humanity. Probably the strongest part of It Comes at Night is how it makes us complicit. There is a situation where we, the audience, are made to feel motivated towards something evil, and feel relief in that evil. It is masterful but difficult. No not difficult, somewhat soul destroying. Perhaps that's why audiences are calling it a "bad movie." We often call movies "bad" when they challenge our comfort with who we are. This movie, masterfully written and directed to cut us just perfectly by Trey Edward Shults and featuring a cast that is spot on perfect throughout, It Comes at Night is a powerful hour and a half that will keep you on the edge of your seat the entire time and leave you thinking about a great deal. Perhaps asking people to wrestle with themes after the movie ends is too much for most folks. For those who appreciate that, It Comes at Night is just the punch in the gut you need.